During the Cold War, the Fulda Gap in Germany was regarded as the most likely route for a Soviet tank assault on West Germany. NATO and Soviet strategists understood the importance of the lowland passes in between the Vogelsburg Mountains, and the area on either side was an armed camp. A large number of the 250,000 U.S. troops deployed in Germany were concentrated there. In today’s Cold War, the new Fulda Gap is the Suwalki Gap, a 60-mile stretch of land on Poland’s northern border with Lithuania (Suwalki is a Polish town); but it also connects the Russian Baltic Sea enclave of Kaliningrad with Belarus, a staunch Moscow ally. Kaliningrad is home to units of the Russian fleet, and to a strong army presence, and like the Fulda Gap, the Suwalki Gap is an object lesson in the geography of conflict. If Putin overran and closed the Suwalki Gap, the Baltic States - Lithuania, Latvia and Estonia - would be cut off from NATO, of which all three are members, and the rest of Europe. Of course, nobody is more aware of this possible scenario than the Baltic states themselves, says Lithuanian Ambassador Rolandas Krisciunas. A special agreement allows the Lithuanians to monitor Russian trains traversing the Suwalki Gap and limiting what they can carry, and where they can stop on the route. And as of 2017, NATO deploys around 1,000 troops in each of the Baltic states which, Ambassador Krisciunas told Diplomatic Connections, is symbolic, but sends a message to the Kremlin that NATO’s Article 5, committing the Alliance to mutual support, is not an empty promise. But, as with its Baltic neighbors, Russia looms large in Lithuania in other respects. The country has an ethnic Russian population (but only 6 percent, compared to more than 30 percent in both Estonia and Latvia); Russians are the country’s biggest tourist group and travel to it in large numbers, and Russia is Lithuania’s number one trading partner. According to Krisciunas, Russian dissidents meet in Vilnius, the Lithuanian capital, to vent against the Putin regime. In April, the presidents of the three Baltic States marked their centenary of independence from Russia with a visit to Washington for a summit with President Donald Trump and other top administration officials, where reassurances of support were forthcoming. The trio were warmly received at the White House in part because all three countries were among the handful of countries which comply with Trump’s insistence that all NATO member states should spend above 2 percent of their GNP on defense. The interview was held at the Lithuanian Embassy on 16th Street in northwest Washington, a building Lithuanian exiled diplomats kept open as their nation's embassy during Lithuania’s years of Soviet occupation. Diplomatic Connections: Please give us your assessment of the recent U.S.-Baltic summit in Washington, in which your president and the heads of state of Latvia and Estonia met with President Trump and other members of the administration. Ambassador Krisciunas: All three Baltic states were very happy with the summit, which was the first of its kind. It was the highlight of a year in which Lithuania celebrates 100 years of the restoration of its independence. The message of our partnership with the United States came very strongly out of this. The meetings themselves were rich in content. We of course discussed security issues, economic ties between the Baltic states and the United States, energy security, and it was emotionally very charged, stressing the long standing relationship. The story of the United States’ relations with the Baltic states is a very strong story of principled U.S. policy. Throughout the Soviet occupation of our country the U.S. always stood by us, and even helped us to retain this building as our embassy. Okay, Lithuania was occupied, but this piece of land had never been occupied, and because it was Lithuania’s diplomatic representation, it was, and is Lithuanian soil. This building is like a monument to our bi-lateral relationship, and we never considered abandoning it because it of the emotional connection. Diplomatic Connections: Let me quote you President Vejonis of Latvia who said in advance of the summit that the Baltic states, “expected a very strong political message from the U.S. expressing support for strengthening Baltic security and expressing once again, support for the independence of the Baltic states.” Did the U.S. deliver that strong message? Ambassador Krisciunas: Yes, of course. As I said, we talked about how much we had accomplished together. We talked about NATO and where the Alliance is heading, and in that context we discussed some issues that were of interest to the President (Trump) who expects NATO to be stronger with the burden shared more equally than it is today, and that’s also the Baltic interest. Diplomatic Connections: However, President Trump has reason to be very pleased with all three Baltic states because you live up to this unofficial benchmark for Alliance members of 2 percent of GDP expenditure on defense that has become holy writ to this administration. Ambassador Krisciunas: That’s right. All of us are spending above 2 percent, and we are not stopping there. In Lithuania, we are currently discussing among all parties so that we will have political agreement, how we will be spending a much bigger amount over the next five years. Two percent is not a goal per se which we achieved, and we’re stopping there. We’re an example for the United States to say to the other NATO members, if the Baltic states can do it, you should be doing this also. And it strengthens our position: we are not security consumers, we’re also security producers. When the United States invited us to join their forces in Afghanistan we went. If we’re asked to contribute in Iraq, we do so. So we’re always listening to whatever is asked by our partners, and we deliver, to the best of our ability. And that, I think, is what NATO should be, everyone delivering to his ability. The more member states contribute to NATO, it will strengthen NATO, not weaken it. Diplomatic Connections: Your country is on the frontier of both NATO and the European Union. How much concern is there in Lithuania about recent Russian aggressiveness? Ambassador Krisciunas: It would be, I would say, not smart to not be concerned. When you see our big neighbor doing the things that it has done in Crimea, earlier in Georgia, in Eastern Ukraine, you’re concerned because you would like to find a reason why this is happening, and what we could expect next. Our situation is much different from any other country in the region because the Baltic states are part of NATO, which comforts us; but at the same time, we are always telling our partners that we cannot relax. We should be very rational about our concern. If Russia believes that NATO is for real, that it will deliver on Art. 5 without the slightest doubt, nothing will happen. That’s the key task: to convince them that NATO is a serious thing, it’s not just an idea that will collapse at the first test, if anyone wants to test it. When we discussed together with other leaders within NATO we say we should be very clear with our messaging, and with our steps. Because what Russia understands best is actions. The Russians will tell different stories about anything that is happening, but I think we have taken a lot of strong steps. Ambassador Krisciunas: It’s enhanced forward presence. In our case in Lithuania, we have Germans as the core battalion, and smaller units from other countries. Each country has a lead force from one country – in our case Germany, in Latvia’s it’s Canada, and in Estonia it’s the United Kingdom. In Poland, the main military presence is American. Diplomatic Connections: Isn’t there also a NATO air force presence to discourage Russian overflights? Ambassador Krisciunas: Oh yes. We always have them, and (different nations) rotate. For some period you have Polish, then French, Belgians, U.S., all the countries that have pledged to participate in this arrangement. It’s also a very strong component because just recently, for example, the planes scrambled to inspect Russian planes approaching Lithuanian air space.. Diplomatic Connections: Are such incidents frequent? Ambassador Krisciunas: It used to happen much more frequently. There was a period when it would happen very often: a day would not go by without seeing something like this. Now it’s from time to time. Diplomatic Connections: Your country shares a frontier with Kaliningrad, the Russian Baltic port separate from the mainland and wedged between Lithuania and Poland. Access from Kaliningrad to Russian ally Belarus is through the Suwalki corridor, across 60 miles of Polish-Lithuanian border territory, but that gap is the Baltic states’ only link to NATO and the European Union: close it, and the Baltic states are cut off. Ambassador Krisciunas: The Suwalki corridor is the distance between the Belarus border and the Kaliningrad-Lithuania border. There are defensive plans, and it’s been taken into account. Belarus is of course a close ally of Russia. Not a lot of people know that we have special arrangements with Kaliningrad. Trains go through Lithuania to Kaliningrad, but there is an agreement what could be on the train, how often it could stop, or not stop at all, what information should be given to us in advance, and there will be our people on the train. We’ve had talks with the Russians about arrangements for the World Cup (June 2018) because some of the activity will be in Kaliningrad. Diplomatic Connections: Meanwhile, there are Russian tourists coming to the Baltics for vacations, and so on. Ambassador Krisciunas: Of course, and Russian tourism is increasing. The Russian tourists still keep on coming, we’re not enemies, and we welcome them. Being concerned about your neighbor doesn’t mean that they are enemies. We’re not at war and there are no issues with the Russian population as such. Of course, we have issues with the government and Putin’s policies, but there’s a fine distinction between the two. And we have a lot of Russian friends who are coming to Lithuania because they can speak freely. In May, there was a Russian forum in Vilnius: Exiled Russians and some people from Russia came together in what is becoming a traditional forum. They discussed different issues – how it is, the current policies, what to expect in the future. Most of them are democratic minded people who are not able to express their feelings in Russia, hence the assembly in Vilnius. The Russian culture is very rich, and is appreciated in Lithuania, it’s the policies of the Putin regime that raise questions and concerns. Diplomatic Connections: When you’re back in Lithuania, do you sense that there is widespread public concern about the situation? Ambassador Krisciunas: It’s not like everyone in Lithuania wakes up in the morning and asks, “Are we still free?” You don’t feel any kind of tension. We don’t believe that anything will happen as long as the neighbors are sending very clear messages, and that’s what we’re doing. It’s much easier in any crisis to prevent something from happening than to deal with the consequences. Diplomatic Connections: Your personal background is more financial then diplomatic. You have had two diplomatic posts, both of them in the United States, but prior to that you have been deputy minister of finance. 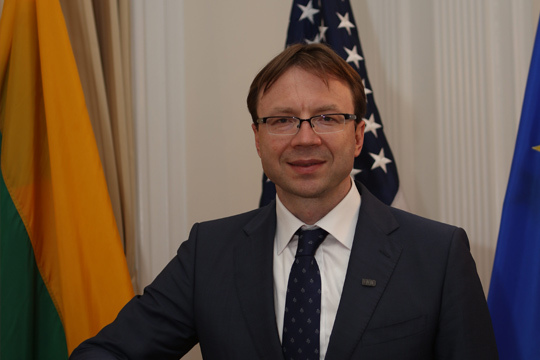 Ambassador Krisciunas: I spent more than ten years in the ministry of finance, but I started my career as a diplomat. After my first posting in Washington, I was asked to establish a department in the ministry of finance preparing for Lithuania’s membership of the European Union. I was a part of the negotiations (with Brussels) on some chapters of the (entry) negotiations and everything went smoothly. My post in the ministry was expected to be for three years, but the work kept changing rapidly, and there were plenty of things which kept me there, among them the global financial crisis of 2008-2009. It was a very hectic time when I would go to the United States to convince people to buy our bonds. We had some fiscal unbalances, our expenditure shot through the roof, and income went down because unemployment was on the rise. So it was very difficult. It was very exciting professionally, but you would like to avoid that kind excitement. Lithuania was able to get through the crisis on its own. We displayed maturity as a state, and persevered. We went through an austerity program, and there was a big drop in GDP the first year; then the next year we had already begun to pick up, and successfully convince the lenders – American investors, and also some Europeans – and in the end we came out of it stronger. Diplomatic Connections: You were in Washington from 1998 to 2001. What differences do you find in D.C., and also is it different to work in this time? Ambassador Krisciunas: At that time I was first secretary for economic affairs, and now I’m ambassador, which is a big difference. Of course, then, as today, Washington was and is a world capital of diplomacy, so anyone coming here is pleased with the job. There’s not a single issue globally that isn’t reflected here. It’s a dream come true for diplomats to attain a Washington posting. Another big difference was 9/11. Before leaving in June, we were living with my family in Crystal City. From my balcony I could see the Pentagon, and it was mind-blowing to see all those pictures on TV of the attack. For me and my family it was especially shocking! Unbelievable! It changed the country quite significantly: the U.S. before September 11, and after September 11 is different. Diplomatic Connections: And Washington as a city? Ambassador Krisciunas: It’s improved in some areas, and in some areas you would say probably not so much, for example, the traffic jams. But new office buildings are popping up; there were some districts you would not ever enter at night, now you see cozy restaurants and so. Demographics have changed. The security is much different. Seventeen years ago in some areas you would think twice to go to a Metro station at night, but not today. And in this neighborhood (Sixteenth Street, Northwest Washington) I remember hearing the story that some years ago Spanish diplomats from (the Spanish Embassy) across the street were mugged, and it wasn’t the safest area. Now, it’s a different story. The politics have changed too, but that’s something you take for granted because nothing stays the same. 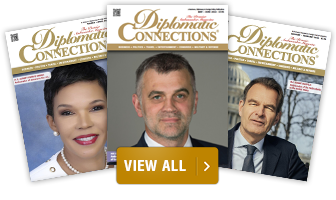 Diplomatic Connections: When you leave Washington what do you hope to have achieved? Ambassador Krisciunas: You always want to make a difference, and my background is economics, and I think that the economic ties is a very strong basis for political cooperation, so I would like to continue to see our bi-lateral trade increasing every year. Fluctuations in the U.S. dollar-euro exchange doesn’t seem to make much difference. Tourism to Lithuania is increasing from the United States: 2017 was the first year that tourism from the U.S. was among the top ten countries, and I like the steady growth there. Diplomatic Connections: What is the size of bi-lateral trade between the two countries? Ambassador Krisciunas: Now it’s getting close to $1.7 billion, that’s in the top ten trading partners. For the U.S. it’s not that big, but if you look at the list of Lithuania’s trading partners, the U.S. is knocking on the door of the top five – top six. Diplomatic Connections: What are Lithuania’s main exports to the U.S.? Ambassador Krisciunas: Dairy products, chemicals, furniture – we are one of the biggest suppliers for IKEA, for example. A lot of what IKEA is selling is manufactured in Lithuania, and that’s why one of the companies that is considering investing in Pennsylvania, which could mean hundreds of jobs in the United States, is one of IKEA’s major suppliers. They want to be closer to their clients. There are negotiations in progress with the local authorities on what would be the locations and what would be the conditions, and it would be the largest Lithuanian investment in the United States. Diplomatic Connections: What about natural gas (LNG)? Ambassador Krisciunas: Until four years ago, we were solely dependent on supplies of gas from Russia, and Russia was abusing its monopoly position; we were paying the highest price for gas in the European Union. It was difficult to explain in economic terms because gas to Germany travels farther than gas to Lithuania, but we had no option; there was only one pipeline and that was coming from Gasprom (Russian national energy company). So we built an LNG terminal and 2017 was a breakthrough year in our bi-lateral relations with the U.S. because that’s when we bought LNG from America. We would like to buy more from the U.S. An LNG terminal just enables us to buy gas from wherever we want, if the price is right. During the summit we signed a memorandum of understanding with two U.S. companies on LNG. Under certain circumstances it makes sense to buy energy from the United States. We have the ability to import gas not just for Lithuania, but also for the region. There is no longer a possible crisis situation in which we are left without gas. Also important for the region is electricity. A couple of years ago we laid an undersea cable to connect us to Sweden, and we built another electricity line to Poland. We are part of the EU, but we used to be an energy island because we were not linked to other European countries for energy. So these projects were very strategic for us. Diplomatic Connections: Is there a Lithuanian diaspora in the United States? Ambassador Krisciunas: Yes, actually the largest Lithuanian diaspora is in the United States. The first wave was in the late 19th century when Lithuania was still occupied by the Russian empire. There are American Lithuanian newspapers which are older than our re-established own state; the oldest is still being published in Chicago, which has the largest concentration of Lithuanian Americans in the United States and dates back more than 107 years. The second wave of immigrants came after World War II. When the Soviets occupied Lithuania thousands were sent to Siberia, thousands were killed, and people were running from the Soviets because they knew what to expect. The most recent one was after the independence of 1990, when the borders opened and anyone could go anywhere, and some people came to the United States, some of them very young. Diplomatic Connections: Is there a reverse migration? Ambassador Krisciunas: Yes, but we still have a negative flow, but it’s stabilizing. Diplomatic Connections: Has there been any change in the public attitude towards the European Union? Ambassador Krisciunas: We are one of the most Euro-optimistic in the European Union. The overwhelming majority is very happy with the new European Union institutions, and trusts the new institutions. It’s one of the most positive attitudes you will find among all the member states. And the other Baltics are not very far off. It’s puzzling why we see more of this than some other countries, like Hungary, or Poland. It might be historical reasons. It might be some other reasons. But yes, we like to be a part of this strong family, which has chosen the democratic way of development, which is the best system, and, of course, being a captive nation for so long we really treasure this family life approach: everyone is there because they believe in the same kind of values, they see their lives in the same trajectory. And the European Union brought peace to Europe. If you look at Europe’s history, it never was so free, so peaceful, and actually so wealthy. And sometimes I hear, if you’re pro-Europe you must be anti-American. No, you don’t need to be anti-American. Lithuanians, Latvians and Estonians are the most pro-American people in Europe. We had our centennial celebration in the Ronald Reagan Building (in Washington, D.C.), and that was symbolic because Reagan is the most respected American president in Lithuania. He fought the Evil Empire and all the Lithuanians were rooting for him, hoping that one day he would succeed, and he did. Lithuanians will never run out of high fives for Americans. When we had American soldiers, they were surprised how, seeing them in uniform, people would come and talk to them. And that’s how it is, and always will be. Diplomatic Connections: Mr. Ambassador, thank you for taking time to speak with Diplomatic Connections. I'm sure our readers will enjoy this interview.